Yes, I'm still alive! I know it's been a few weeks since I've blogged. . . report cards, student-led conferences, Thanksgiving, blah, blah, blah. No more time for excuses!! My district is lucky enough to have the whole week off for Thanksgiving, but instead of blogging, I've been scrapbooking, prepping for Rose Parade floats, getting massages, cleaning out my garage, and loading up my car full of donations for Salvation Army. (I'm feeling quite accomplished! Although you did not see me mention "working out". . .that is still on my "to do" list. . .sigh. . .) and my youngest & I had a lovely Mommy-Daughter date night at Beauty & the Beast. We just love live theater; it was a fabulous show! AND I've been working on a few new products & revised a few old products! Just in time for Cyber Monday!! 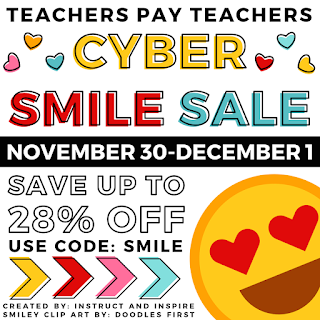 My whole store is 20% off November 30th-December 1st and if you enter the code SMILE, you get an extra % off!! Click on the button below to start filling your cart!